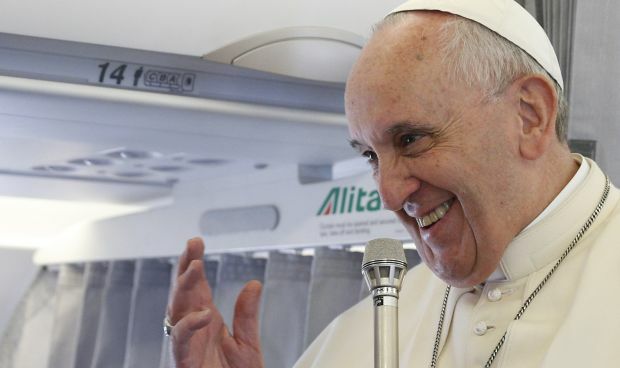 WASHINGTON (CNS) — To date, the only city officially announced for a September visit by Pope Francis is Philadelphia, where he will attend the eighth World Meeting of Families. However, other cities are still making their bid to be part of a papal itinerary. Talk persists about the pope including two more East Coast cities on his first U.S. visit as pontiff. One is Washington, where he has been issued an invitation to address a joint session of Congress. The other is New York, where he has been invited to address the United Nations General Assembly. Even before the Philadelphia visit was confirmed by the Vatican, which was Nov. 17, the pope told reporters accompanying him on the plane back from South Korea in August he wanted to go Philadelphia and noted the invitations from Washington and New York. “Maybe the three cities together, no?” he said. Catholics in Detroit, which only emerged in early December from a yearlong bankruptcy, did not get attached to the papal itinerary despite a letter-writing campaign by students at Catholic schools in the city. Margaret Cone, who helped shepherd the letter-writing initiative, told Catholic News Service that an appeal for a papal visit could take an additional tack. A globally recognized center on infant mortality is located in Detroit, in the Detroit Medical Center complex — now one of the city’s largest private employers. Pope Francis is keenly interested in infant mortality, Cone said. New Detroit Mayor Mike Duggan, a Catholic, had been CEO of the Detroit Medical Center before taking the mayoral reins. “This is a global issue and Detroit is at the epicenter of all this,” Cone said, adding that giving the pope “someplace to visit” would help in a Detroit bid. Where else might Pope Francis go if he accepts their invitations? — Birmingham, Alabama. “We sent a letter to the Holy Father about a year ago inviting him to come to Birmingham because of the international recognition that Birmingham has as cradle of the civil rights movement,” Mayor William Bell told AL.com. “We had not heard back from them until recently.” The city hosted the Dalai Lama this fall. — Boston. Mayor Martin Walsh asked Cardinal Sean P. O’Malley of Boston to deliver the invitation to Pope Francis. St. John Paul II visited Boston in 1979. In the letter, Walsh said he would love to have Pope Francis bless a park in Dorchester, Massachusetts, named for the new saint. — Buffalo, New York, originator of the “Mass Mob” movement where Catholics go to old churches in the city for Mass. The Buffalo Mass Mob issued its own invitation. “If the pope came to Buffalo, it would be historic and a spiritual boost to the whole Niagara Frontier,” said Mass Mob organizer Greg Witul. — Dallas. Students at the University of Dallas, a Catholic college, launched a letter-writing campaign to have Pope Francis visit. “Every single prayer and every single letter counts!” wrote student Alex Doucet in a message to students, alumni and their families. — El Paso, Texas. “There is no community on the border that is as large as our own — with Juarez, El Paso and extending to the whole metropolitan area of Las Cruces — we think that’s a good reason and a great place to come, Bishop Mark J. Seitz of El Paso told the El Paso Times. “This is also a great area to highlight the international cooperation that we have between our cities.” He issued the invitation jointly with Bishops Oscar Cantu of Las Cruces, New Mexico, and Renato Ascencio Leon of Juarez, Mexico. — Green Bay, Wisconsin: “It comes back to why not Green Bay?” Mayor Jim Schmitt told The Compass, Green Bay’s diocesan newspaper, last February. “It just seems that there’s a whole lot of synergy with what the pope speaks and what the greater community of Green Bay believes,” he said, adding it is possible the pope could celebrate Mass at Lambeau Field, home to football’s Green Bay Packers. — St. Augustine, Florida. The diocese will celebrate its 450th anniversary in 2015. Mayor Joe Boles issued an invitation a year ago. The Freedom From Religion Foundation asked him to rescind it, saying it was “fiscally reckless” of the mayor to do so. Boles said he would not withdraw it. Of course, it’s not just U.S. cities that are hoping for a papal visit. Mexico City has been talked about as one possible destination. President Enrique Pena Nieto announced in June after a visit with Pope Francis in the Vatican that the pope had accepted an invitation to visit Mexico, but the Vatican has not confirmed that.